From a seated position on the knees such as Child Pose (Balasana) place the forearms on the mat. Raise the heels up and move the toes forward. Straighten the legs like in Downward dog but having the forearms on the mat. Walk the legs forward then spring up with one leg allowing the other leg to follow. Align the feet over the head. Straighten the legs. Tuck the tailbone in for pelvic stability and raise the navel back for abdominal stability. Leave room for breathing. Engaging the abdominal too much or straining in the posture can restrict breathing. Try to engage the lower abdominal but slightly higher relax so that the movement of the diaphragm can move more freely. Push down though the arms so that deep shoulder muscles are engaged and a lift occurs. This should also be done in the handstand. It allows more space and reduces any compression in the joint. The complicated firing of the nerves needed to maintain balance in the body during breathing exercises the mind as well. Breathing causes a continual change in the bodies shape. In the elements it is said that “the air is light yet it moves the earth and water”. It really is the internal earth that draws the air in. Muscles in the arms and shoulders are toned and strengthened. These include the deltoid group, triceps, a little biceps the Trapezius Muscles (Middle and lower), Rhomboids and Latissimus Dorsi. Shoulder elevation also involves glenohumeral movement in combination with scapulothoracic movement and thoracic extension. 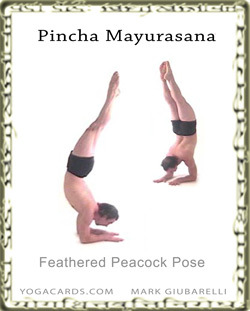 Postures like the Handstand (Adho Mukha Vrksasana) help strengthen the shoulders. Practice these kinds of postures with advanced students.